A creative work can be inspired in any number of ways. For playwright Elaine Jarvik, An Evening With Two Awful Men was born thanks to an intriguing prompt from Plan-B Theatre Co. artistic director Jerry Rapier: "Do you want to write a play about our only gay president?" "I had no idea who he meant, and when he said it was James Buchanan, I realized I couldn't quite place him among the fairly non-descript 19th-century men who had led our country," Jarvik says. "As I began researching Buchanan, I wasn't so sure about his alleged gayness, but I became more and more intrigued by the fact that several biographies and internet lists call him 'the worst president ever.'" Buchanan is only one of the titular two awful men in a production that posits a popular show called Dead People Live, where historical villains are able to defend their legacies. On the particular evening when President Buchanan is auditioning for Dead People Live, John Wilkes Booth also shares his story. "Alas, [Buchanan] was ... kind of boring," Jarvik says. "So I felt that the play needed a foil who was his exact opposite: rash, a ladies' man, dramatic. And that was Booth." Award-winning playwright Julie Jensen's Wait! premiered at Salt Lake Acting Co. in 2003. Since then, other local and nationwide theaters have picked it up. 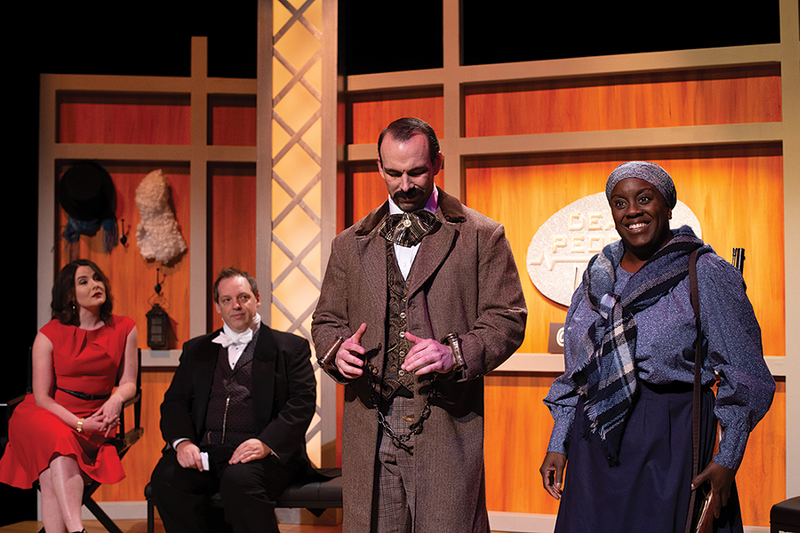 This month's production by Pygmalion Theatre Co., however, differs from others because Jensen collaborated directly with the actors and director. The humorous yet heartwarming play "focuses on the absurdity of ourselves—how funny we can be when we're vulnerable," Jensen says. Growing up gay and entering the theater inspired Jensen to craft a nuanced love story that makes fun of self-involved directors and producers. Wait! also demonstrates Jensen's capacity to explore the "diverse, artistic and creative experiences between intersectional voices of immigrants and those of the LGBTQ community," Mark Brocksmith, who plays the characters Dad, Lu and Hazar, says. Protagonist Wendy Burger's mythical hometown of Walrus, Utah, seems no more than an aspiring tourist attraction. However, the tight-knit community speaks in rural accents and frowns upon those who do not fit into the straight, white, conservative demographic. Wendy's youthful, liberal lesbian character starkly contrasts with her father's bigotry and her community's intolerance. It's a time-worn adage—coined by historian Laurel Thatcher Ulrich—that "Well-behaved women seldom make history." The Other Mozart tries to right this wrong by telling the imagined inner life of Maria Anna Mozart—also known as Nannerl—the musically talented and older sister of the more famous (and male) Wolfgang Amadeus Mozart. Sylvia Milo, playwright, actor and producer of the one-woman show, says although she studied to be a violinist, she never heard of this other genius Mozart until she stumbled on a portrait of her by chance while visiting Wolfgang's home in Vienna. "To bring this other Mozart to people's minds is to open their awareness to the stories that have been overlooked for too long," Milo says. "It brings women into the history of the great. And it brings awareness to the inequalities that still persist today." Nannerl performed with her younger brother and was well-reviewed. However, any promise she had as a musician was cut short when she was forced to retire at 18. Even so, we know she continued to create music, though none of it survives. Odyssey Dance Theatre has demonstrated a unique grace and finesse throughout its 25-year history, and as it celebrates the quarter-century anniversary of its founding this spring, the company revisits many of its monumental works as part of the popular Shut Up & Dance repertory series. Each offering reflects the company's remarkable versatility and variety, from ballet, ballroom and tap to hip-hop and modern dance—all intrinsic elements that contribute to Odyssey's daring and diversity. 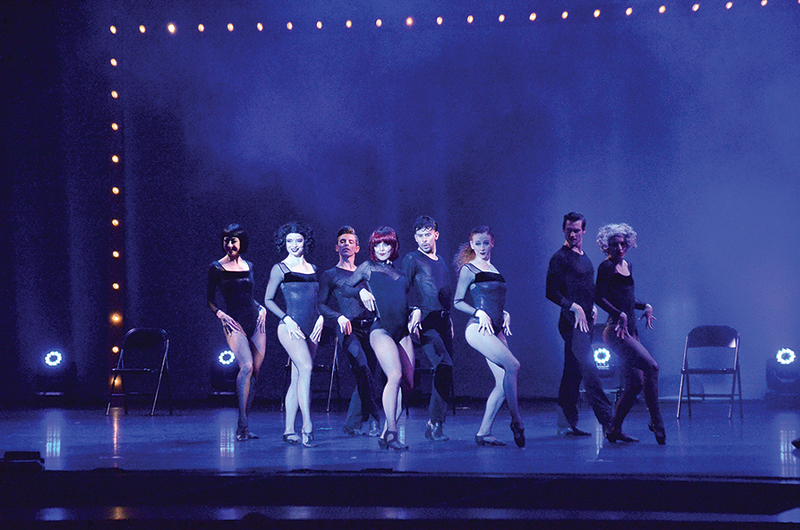 The three spotlight productions include last year's world premiere Chicago Nights (pictured), a rousing return to the era of swing, speakeasies, gangsters and Prohibition; Romeo+Juliet, a salute to Shakespeare's classic tale of star-crossed lovers choreographed to the accompaniment of a Latin, hip-hop and contemporary score; and Reflections, a superb sampling of highlights from Odyssey's storied repertoire. With so much to choose from, Odyssey founder, artistic director and choreographer Derryl Yeager admitted in an email he faced tough choices. "I chose Chicago Nights because it was a huge hit last year," Yeager explained. "I chose Romeo+Juliet because it is one of Odyssey's all-time favorite full-length productions. Reflections will have the best of the best in the program, significant pieces from our years of innovative contemporary works—all the shows that celebrate that which is Odyssey Dance Theatre!"